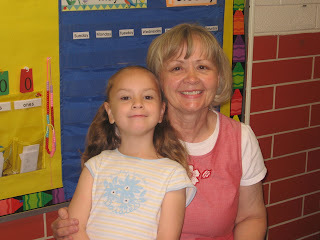 The Massaglia Family website: Last day of school!! Today was the last day of school. 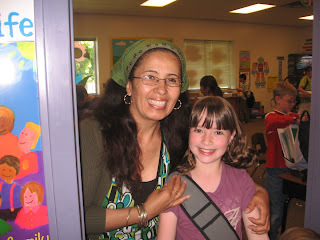 I took pics of the girls with their teachers and they are all really cute. 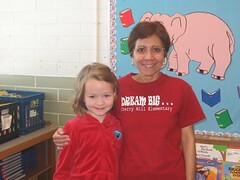 Scarlett really loved her teacher and even gave her a picture that said I wish you could be my teacher forever. It was really sweet. We went to the park after we walked home from school today and before I could even finish getting stuff out of the car, Scarlett had fallen off her scooter and skinned her knees really bad. 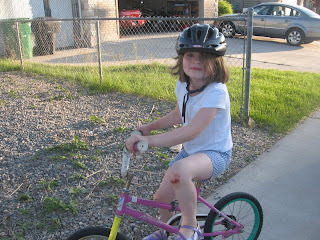 You can see them in the pic of her on the bike. We just turned around and went home, so they didn't get to play at the park today. A few hours later, (after she stopped crying about her knees hurting) Scarlett said "let's go back to the park", but I didn't think it was a good idea, so the kids played in the back yard for the rest of the day. We also sold the old minivan today as well. (We bought a used '06 Chrysler Town and Country van in March) We were happy to get that over with as well. Now what are we going to do with school over? I say sleep in for as long as we can. The kids had to go at 8am every day this week and it about killed me. Too bad Dante doesn't know how to sleep later than the minute after John leaves, which is usually at 6:59am. Sometimes he wakes up before John leaves for work also. John really wants to get black out curtains for his room. If only we had a guarantee that it would actually work. Wow I can't believe they are out of school already! We still have one more week. That's exciting that you sold your van. Do you like your new one? Hey! I leave way earlier than 6:59 AM.